Members of the military serve their country in myriad ways. That includes helping researchers figure out whether obesity is a contagious disease. A new study involving thousands of military families suggests that the answer is yes. Human ingenuity has combined fats and carbohydrates to produce such crowning culinary glories as the doughnut, fettuccine Alfredo, nachos and chocolate cake with buttercream frosting. These delectables do not exist in nature. Nor does the human capacity to intuit their calorie content. I made a very important life decision a couple of years ago. I wanted to eat better. Although my diet was okay, there were still too many industrially produced and ultra-processed food-like substances, too many added engineered sweeteners (HFCS and other sugars seem to be in almost everything even when they shouldn’t be – just check out your pasta sauce or bread), too much non-organic produce, too much tainted animal product, and most certainly too much nutritionally degraded long-distance produce from South America, Australia and points unknown. So I decided to gradually transition as much as I could toward healthier, more sustainably produced and locally grown foods. Sounds great, doesn’t it? Well, that was all fine and good until I really started digging in. It was at that point I realized this was going to be expensive. How was I going to be able to afford all this? I first took a look at my overall monthly spending across everything. Wow! Shocking! When I finally recovered from that seizure, I found a lot of easy ways to save a bunch – e.g. dropping the land-line, renegotiating cable TV, Internet and newspaper subscription rates, etc. But we’re more concerned here about how to get good food more affordably. So my mission over the next year will be to figure this all out. I’m a little nervous about this. It will be a lot of experimenting, trial and error, maybe even a mild case food poisoning. I’ll be documenting my adventures here on the Pasadena Learning Gardens website so you guys can benefit from what I’m doing, learn from my mistakes, and hopefully improve your health and your pocketbook at the same time. Finding the right source – Good quality food at a good price. So for starters, I want to talk about store-bought foods that may seem healthy and cheap but really aren’t. I first looked at some of the stuff I was buying regularly at the store and calculated how much it was costing me per serving. That’s when I realized how expensive a lot of it actually is. Case in point: Iced Green Tea. I love iced tea, especially green iced tea. I used to buy about four 33.8 oz. bottles of Trader Joe’s Unsweetened Green Iced Tea per week, preservatives and all, for $1.49 each. (Don’t get me wrong – this TJ’s tea is pretty good from a health and cost perspective versus most of the competition, but I can do better.) I typically get about three servings per bottle and I drink at least two servings per day. So at $0.50 per serving, I was spending $1 per day or $30 per month on green iced tea. On a trip to 99 Ranch Market, I took a look at the basic green tea in bags like the kind you get at Chinese restaurants. They had regular green and Jasmine green for $3.29 for 100 bags (I think there was one that was even cheaper). After tasting a few kinds, I settled on the Jasmine green, which tastes great and I don’t need to use any sweetener. I brew about one gallon each week (slightly less than the amount in the four bottles per week I used of the TJ’s stuff, which was my weekly addiction) using eight tea bags per gallon. And I do it directly in the refrigerator so no need for hot water. (I let it brew overnight and it tastes great.) The tea bags alone cost about $0.28 per gallon while LA DWP charges me about half a cent for the water. The water filter on my faucet maybe runs another penny or so per gallon in terms of cartridge costs. Total Cost: somewhere around $0.30 per gallon for my green tea, or less than $0.03 per serving – versus $0.50 with the premade stuff. So I turned a $30 per month habit into one that runs less than $2 per month. And I avoid the preservatives. Avoid sun-brewed tea. It can easily harbor bacteria and you really only can store it a day or two. For regular brewed tea, I’ve read it can last in the refrigerator in an airtight container as long as two weeks but more often I read that it lasts 4 – 5 days before turning and starting to taste stale. Note that this is if the tea is unsweetened. If it’s sweetened, much shorter, maybe a day or two at the most. 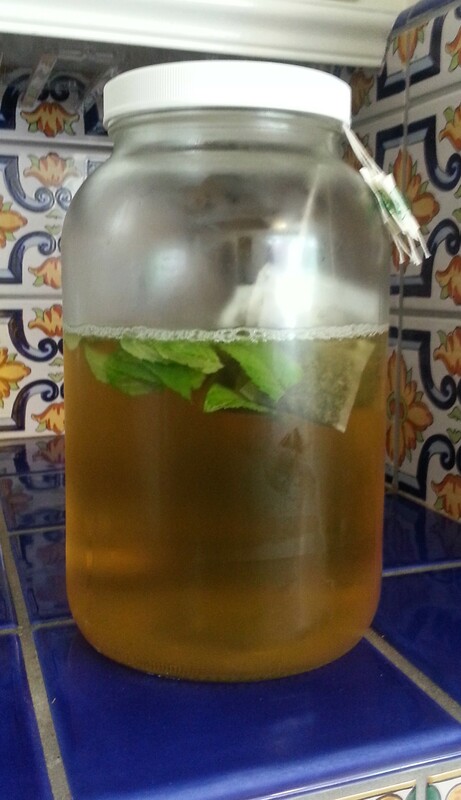 If you put a sprig of fresh mint into the water while it’s brewing, it can last a day or two longer. And it will also keep longer if you put it in the fridge immediately after making it. The less time any food spends at room temperature, the better. I actually brew it in the refrigerator thus no hot water. I brew it overnight. I’ve read that it can last about 3 – 4 days so I brew about 2/3 of a gallon at a time. Make sure to clean your tea jug or bottle regularly with soap and hot water – or run it through the dishwasher. There are many great ways to flavor or sweeten your tea. Check out www.theyummylife.com/Flavored_Iced_Tea_Recipes for some great ideas. But remember, when you sweeten it the shelf life will be shorter. So try out green iced tea for starters. It’s really easy. And check back next week. It will be even more ambitious. We’re going to try fermenting. Categories: Eat Well | Tags: Affordable, Nutrition | Permalink.